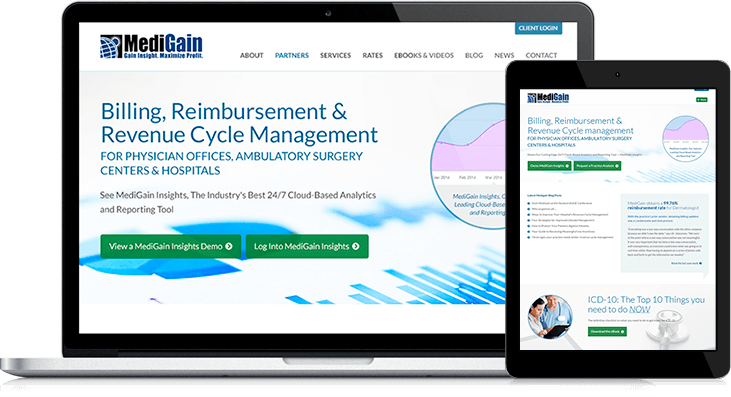 MediGain is a full-service revenue cycle management company - working with healthcare providers to navigate and succeed in an increasingly complex reimbursement environment. MediGain is a global company with an integrated portfolio of leading information technology, process, and domain expertise solutions to address the wide array of threats to the financial health of medical practices, clinics, hospitals, and other essential providers. The design now appeals to a wider range of potential clients - from small general practioner's to large medical billing companies.